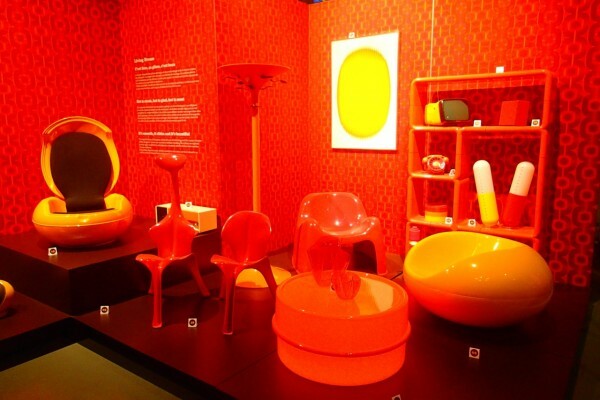 When Eurostar had a sale in January, wardy and I saw it as an ideal opportunity to make our long-considered trip to the Hergé Museum near Brussels. Weekend tickets at the sale price went quickly, but I snapped up a Monday...only to find that that's when the museum is shut. 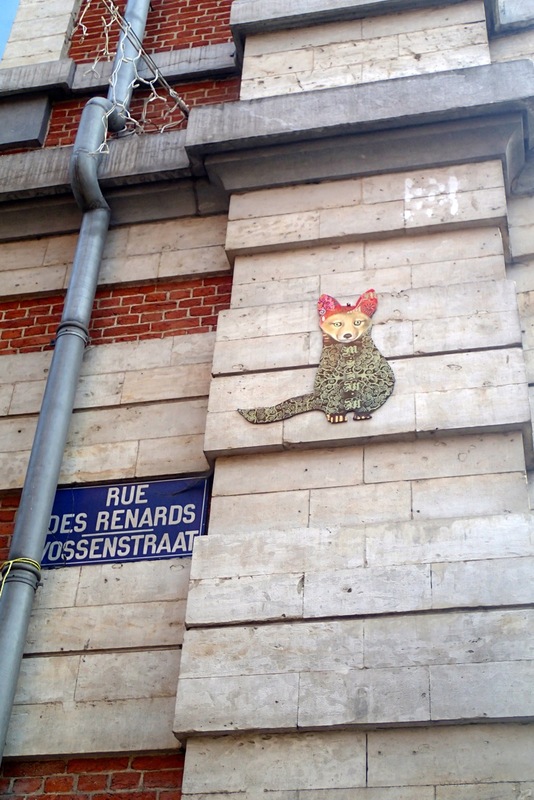 There's plenty of other stuff to see in Brussels, though, so we were not downhearted. I was cross when Eurostar moved their operation from handy Waterloo to inconvenient St Pancras, but they have made up for it somewhat by opening a station just outside Dartford, thus removing the need for all that tedious mucking about in central London. It was raining when we set off two up for Ebbsfleet, but once we escaped the South Circular on to the A2 a pale sun appeared and the sky began to brighten. I dropped Wardy off at the pickup point and went off in search of a motorcycle parking space (free, secure and covered, it turns out) while he got the coffees in. I wasn't prepared for airport-style security, but I was impressed by the special cupholders that take your coffee through the X-ray machine. After a short wait in the departure lounge we were released on to the platform, where marked entry points allowed us to step straight into Carriage 001 and find seats 77 and 78. 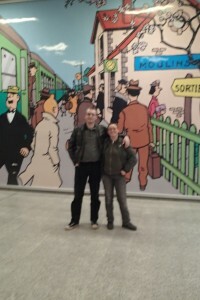 Arrival in Brussels' Gare du Midi was bewilderingly swift, and we found our first Tintin mural in the station. After visiting the tourist information office for the official Tintin Trail map, we enjoyed a traditional Belgian meal of mystery-meat-and-chips before hitting the Metro. Yes. 'Orange Dreams', a celebration of orange plastic stuff from the late 1960s. You travel between the spheres by lift (at an ear-popping 5 metres per second; when first built, it was the fastest lift in the world), escalator and scary metal staircases. 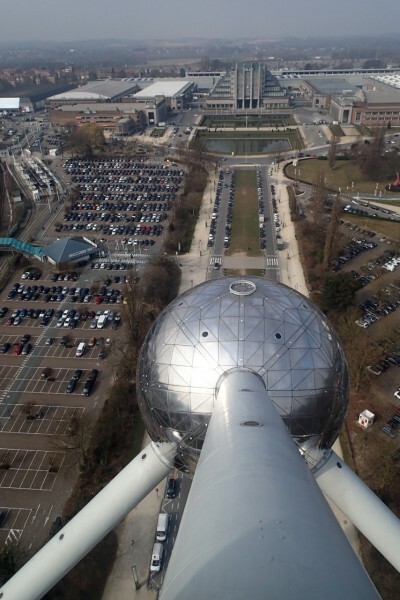 When we'd exhausted the thrills of the Atomium, we hopped back on the Metro to collect some of the sights on the Tintin Trail. 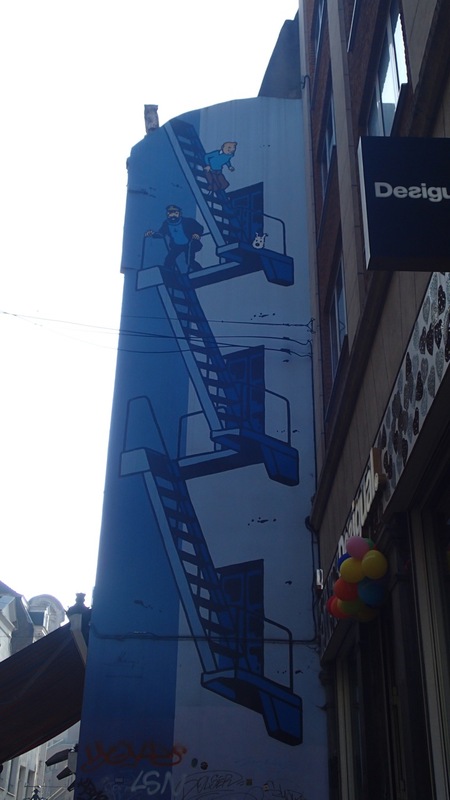 We bagged four: the Tintin shop (identical to the Covent Garden one, but larger), an impressive mural covering the entire end wall of a building, the house of Hergé's grandmother on whose address he undoubtably based Tintin's of 26 Labrador Road, and the large sign on top of the Lombard publishing company building. By now it was more than time for a rest and a spot of people-watching. Soon we were sitting on the cobbled Street of the Foxes, by a fountain, drinking beer or coffee according to preference - in short, exactly what one comes to Brussels for. Refreshed, we began to search for somewhere to grab an early dinner before the return journey. I was concerned that there seemed to be no middle ground between 'expensive' and 'dive', but we found it at De Stoefer on the Place du Jeu de Balle (also a Tintin location: the scene of the flea market where Tintin buys the model ship for Captain Haddock in The Secret of the Unicorn). Here, surrounded by African curios straight out of The Broken Ear, I had stoemp, or mashed root vegetables, which came in a cylinder with a large sausage curled lovingly around it and a slice of bacon on top, and possibly fared better than Wardy whose prawn croquettes were delicious but insubstantial. 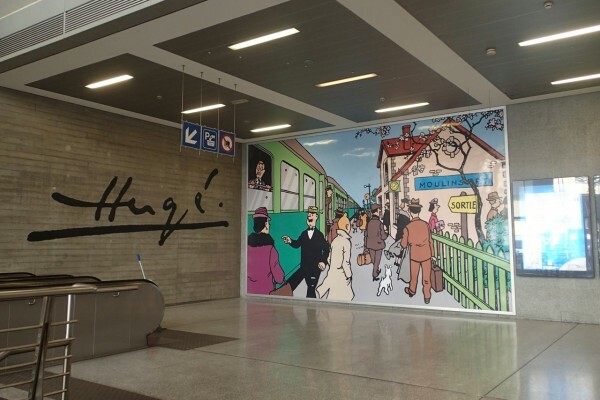 Back at the station, we persuaded a kindly Belgian to photograph us in front of the mural attempting to do the Tintin/Chang pose from The Blue Lotus before checking in. He wasn't a very good photographer, alas (though better than the one in the book, whose camera conceals a gun.) The train pulled into Ebbsfleet at ten past nine in the evening, and we were home just over 45 minutes later. On the outbound leg I started, and on the return journey finished, Jonathan Coe's Expo 58, which I had been saving specially. They actually X-ray your bags before you can go on a train? Wow, that's new. Over here nobody will even look at you, or your baggage, or your ticket for that matter, until you are on the train and it's left and the conductor's come in saying "tickets please". I've noticed that the UK is more strict about these matters when I've travelled by train there before (England, Scotland and Wales — I'm oddly proud of that! ), but I didn't know it was this strict. Sounds like a fun little excursion, though! I didn't expect any sort of security at all, since when you take a vehicle through the Channel Tunnel they check your ticket and passport and that's it. Once through the gates, though, nobody checked tickets on the train. It was a rather fun day out! Shame the mural photo didn't come out very well but, as you pointed out, we weren't shot either...so, yay! I was disappointed about that - wonder if I had the camera on the wrong setting or if he was just massively incompetent? Who knows? Oh, well - better luck next time!